Some library consultants recommend that library buildings have no permanent interior walls so they can respond to changing requirements. That has led to some boring library buildings. 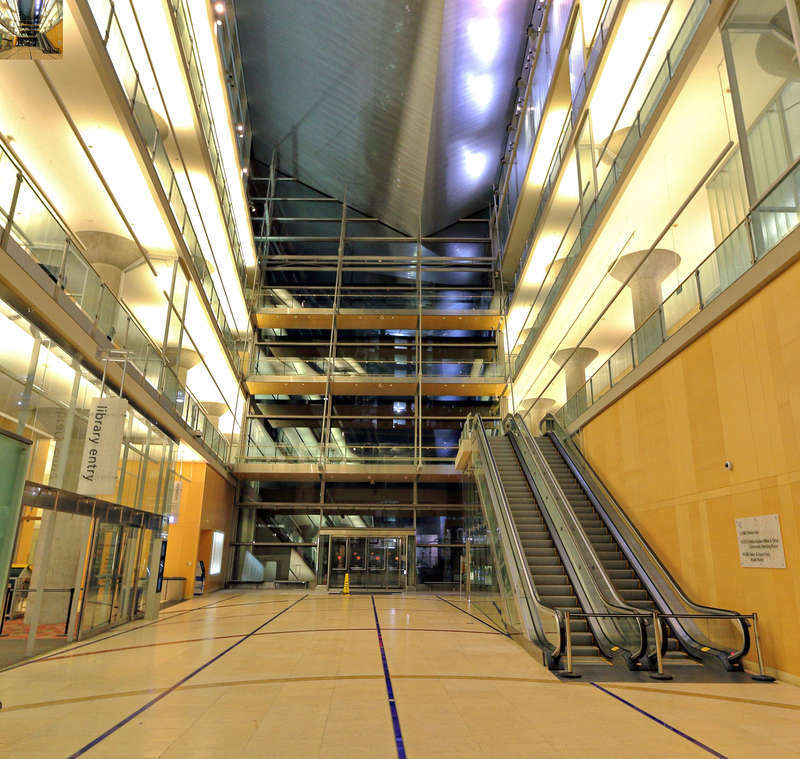 And while this building is airy and open, it is certainly not boring! 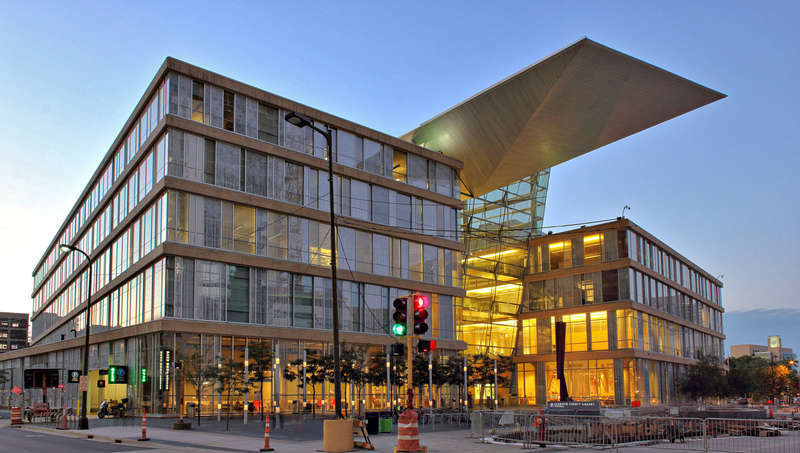 The most obvious and striking component of the Minneapolis Central Library is that big thing looming over Nicollet. Is it a wing? A gigantic mineral crystal? Only architect Cesar Pelli knows for sure, but whatever it is, it certainly catches your eye. 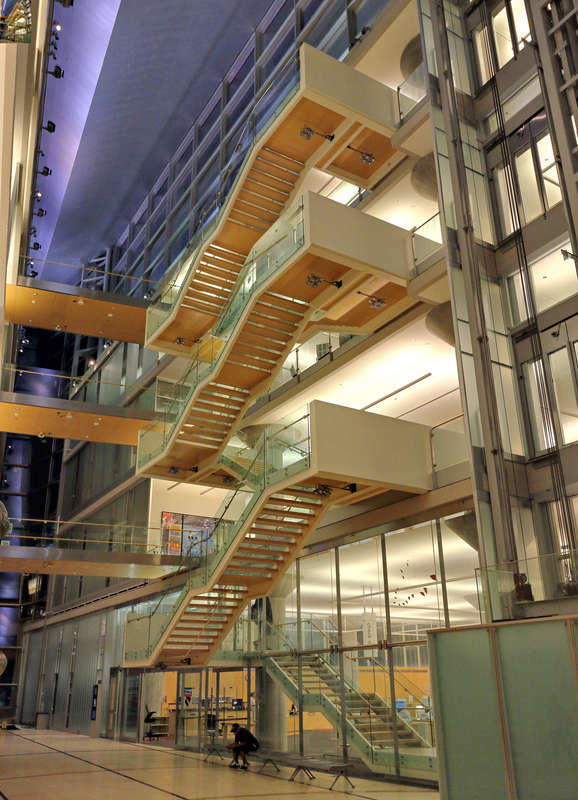 The entrance atrium, which rises dramatically to the full height of the building, is wedge-shaped to compensate for the fact that the streets on the front and back sides, Hennepin Avenue and Nicollet, are not parallel. This is the second library built on this site. The previous building, constructed in 1961, was technologically outdated and too small. During construction of the current 2006 building, the entire library collection was temporarily stored in the Marquette Plaza building a block away. The building’s interior is bathed in natural light that filters through windows on all four sides. The window glass is a three-layer sandwich with clear glass on the inside and outside and a thin layer of etched glass in between. Each of the four sides features a different etched pattern with a Minnesota theme: snow, prairie grass, birch trees, and water. Besides being visually interesting, the etched glass filters light to protect the books and reduce heat gain. Another “green” element, this one designed by landscape architects Coen and Partners, is a rooftop garden of low-rise, low-maintenance plants. Street-level landscaping, consisting of big chunks of slate interspersed with birch trees, surrounds the building. Don’t miss the huge bird’s-eye-view painting of the Twin Cities on the 4th floor that was created by architect John Jager and displayed at the 1904 St. Louis World’s Fair. The painting, done for the Twin Cities Rapid Transit Company (precursor of Metro Transit), shows turn-of-the-century street car lines and is part of the library’s amazing art collection. 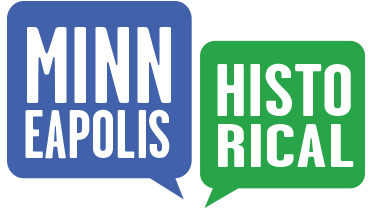 Richard L. Kronick & Lisa Middag, “Minneapolis Downtown Library (part of Hennepin County Library System),” Minneapolis Historical, accessed April 18, 2019, http://minneapolishistorical.org/items/show/165.